Where do the borders between chamber music and concertante works run? At what point does pedagogical music become a work of art? 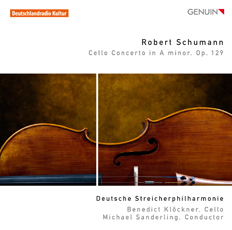 The wonderful new GENUIN CD by the Deutsche Streicherphilharmonie featuring cellist Benedict Klöckner provides musical answers to these questions and does so without losing too much breath over it... The two versions of the Schumann cello concerto recorded here impressively highlight the young cello soloist, whose performance never sacrifices the intimacy of the most Romantic of all cello concertos on the altar of technical brilliance. Hearing the concerto as a cello quartet will be a novel experience to many. A first on the CD release: the version for cello and chamber orchestra. An inspiration to all lovers of classical music! 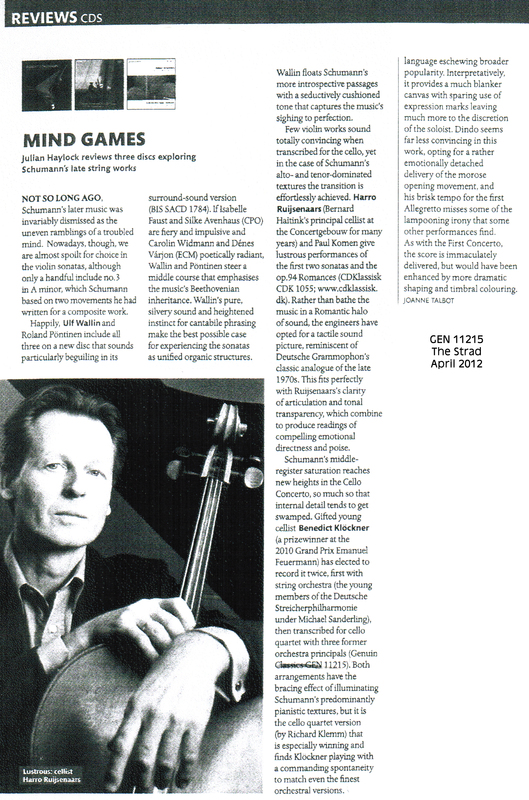 "... it is the cello quartet version that is especially winning and finds Klöckner playing with a commanding spontaneity to match even the finest orchestral versions." "What this new recording offers is a beautifully recorded full sound, and fine, rhythmically powerful, passionate performances in arrangements many listeners will not previously have heard."